We’ll never ask you to send us personal information such as an account number, card PIN or Social Security or Tax ID over text or email. If you do receive a request like this or any other suspicious phishing email, please forward it to us at abuse@bankofamerica.com. We will only reply to your message if we require additional information. Request your free credit report(s) annually and review them for inaccuracies. You can get complete information about obtaining your report(s) at AnnualCreditReport.com. Privacy notices explain how we collect, use and share information. You can manage your marketing preferences and limit the sharing of certain information by updating your individual Bank of America privacy choices. We’ll never ask you to send us personal information (like your Social Security number or ATM PIN) over text or email. If you do receive a request like this, please forward it to us at abuse@bankofamerica.com. Our team reviews all submissions; we will only reply to your message if we require additional information. We fully authenticate all of our emails. Make sure the email address we have on file for you is not a forwarded email (for example, you might forward mail from your college.edu address to your gmail.com account). Avoid sending confidential information through unsecured email, fax or texts to reduce the risk of it being improperly accessed. Be sure to keep your contact information (especially your cell phone number and email address) current. Enroll in Verify Your Visa Card is With You to allow us to approve transactions when you travel. Taking proper precautions helps to make sure your personal and financial information — as well as your identity — remains safe. Only download software or applications from well-known or reputable sources, such as Apple, Google Play or Microsoft. Check the logos, developer names and reviews to spot fake applications. Scammers count on users being too busy to see differences that can make fake software easier to spot. Turn off Wi-Fi and Bluetooth services when you're not using them, and avoid using public Wi-Fi for financial transactions unless you use a secure, private connection, like VPN software. Back up your data regularly. If you use online or cloud storage, be sure you understand your provider's privacy and security policies and keep your access codes safe. Use the administrator log in on your home computer only for creating new users and installing software. If you use administrator accounts when browsing the internet, banking or reading email, the risk of malicious code entering your computer without detection is much greater. Create standard user accounts for yourself and everyone in your family to limit your exposure. Our Mobile Banking service incorporates the convenience you want with industry-leading safety and security features that help provide peace of mind. Turn off Wi-Fi and Bluetooth services when you’re not using them, and avoid using public Wi-Fi for financial transactions unless you use a secure, private connection, like VPN software. Never root or jailbreak your own mobile device to gain access to unofficial applications. This practice may lead to security vulnerabilities and the inability to apply future software updates from the vendor. Scammers use a variety of techniques – here are a few examples. Sending mailers to older adults that request the payment of a small fee in order to receive a big sweepstakes prize. Posing as government officials, security officers, tax collectors, tech support or even as Bank of America. The scammer may say they’re helping you resolve an issue, can assist with a software license renewal or that there’s fraud on your account. If you receive a suspicious call, text or email from someone claiming to be from Bank of America, do not respond, click links or open attachments. If this has happened to you, contact us right away at 800.432.1000. Is the requestor rushing or pressuring you? Is the person asking for money someone you’ve never met? If a business is requesting that you wire money or send funds online, is it to a new account number or different from what was described on initial paperwork? Is the phone number that’s calling you (from, for example, your title company, contractor or attorney) different than usual? Are you being pressured to send money to claim lottery funds or some other form of prize? If you can answer yes to any of these, think carefully about the request to send money. It may be a scam. If you believe you may have been the victim of a scam, report your experience to the FTC and/or to the FBI’s Internet Crime Complaint Center. Provide as many specific details as you can and be as descriptive about your experience as possible. Know your customers’ habits, including their payment amounts, reasons and details. 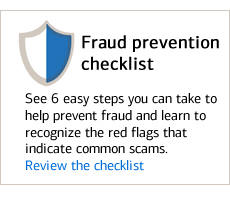 Look out for any significant changes to those habits – they might signal a fraud issue. Ensure all business data is securely and regularly backed up. Test the recovery function of your backup procedures regularly to make sure your data is always retrievable. Develop a plan for cybersecurity and fraud disaster recovery. For more fraud prevention best practices for small businesses, check out our Small Business Online Community. Privacy notices explain how we collect, use and share information. You can easily manage your marketing preferences (direct mail, telephone and email) and limit certain information-sharing practices – it’s easy, and it takes just a few minutes. WHAT DOES BANK OF AMERICA DO WITH YOUR PERSONAL INFORMATION? Financial companies choose how they share your personal information. Under federal law, that means personally identifiable information. Federal law gives consumers the right to limit some but not all sharing. Federal law also requires us to tell you how we collect, share, and protect your personal information. Please read this notice carefully to understand what we do. All financial companies need to share customers’ personal information to run their everyday business. In the section below, we list the reasons financial companies can share their customers’ personal information; the reasons Bank of America chooses to share; and whether you can limit this sharing. Does Bank of America share? If you are a new customer, we can begin sharing your information 45 days from the date we sent this notice. When you are no longer our customer, we continue to share your information as described in this notice. However, you can contact us at any time to limit our sharing. Direct marketing is email, postal mail and telephone marketing. Your telephone and postal mail opt-out choices will last for five years, subject to applicable law. Even if you limit direct marketing, we may still contact you to service your account or as otherwise allowed by law. Bank of America U.S. legal entities that utilize the names: Bank of America, Banc of America, U.S. Trust or Merrill Lynch, as well as the entities listed in the Bank of America U.S. legal entities section. How does Bank of America protect my personal information? To protect your personal information from unauthorized access and use, we use security measures that comply with federal law. These measures include computer safeguards and secured files and buildings. For more information visit bankofamerica.com/security or ml.com/security. How does Bank of America collect my personal information? State laws and individual Bank of America companies may give you more rights to limit sharing. See Other important information section for your rights under state law. Your choices will apply to you alone unless you tell us otherwise. However, your choice to limit sharing with nonaffiliates to market to you for credit card accounts or Sponsored Accounts will apply to all joint account holders. If you have more than one credit card account or Sponsored Account and you choose to opt out, you will need to do so for each account. Our affiliates include companies that utilize the names Bank of America, Banc of America, U.S. Trust or Merrill Lynch, as well as financial companies such as General Fidelity Life Insurance Company. Nonaffiliates we share with can include financial services companies such as insurance agencies or mortgage brokers, nonfinancial companies such as retailers, travel companies and membership groups, other companies such as nonprofit groups. Our joint marketing partners include financial service companies. Do Not Call Policy. This notice is the Bank of America Do Not Call Policy under the Telephone Consumer Protection Act. We do not solicit via telephone numbers listed on the state or federal Do Not Call lists, unless the law allows. Bank of America employees receive training on how to document and process telephone marketing choices. Consumers who ask not to receive telephone solicitations from Bank of America will be placed on the Bank of America Do Not Call list and will not be called in any future campaigns, including those of Bank of America affiliates. Call Monitoring and Recording. If you communicate with us by telephone, we may monitor or record the call. For Nevada residents only. We are providing you this notice under state law. You may be placed on our internal Do Not Call List by following the directions in the To limit direct marketing contact section. Nevada law requires we provide the following contact information: Bureau of Consumer Protection, Office of the Nevada Attorney General, 555 E. Washington St., Suite 3900, Las Vegas, NV 89101; Phone number: 702.486.3132; email: aginfo@ag.nv.gov. Bank of America, P.O. Box 25118 Tampa, FL 33622-5118; Phone number: 888.341.5000; Click on “Contact Us” at bankofamerica.com/privacy. Vermont: Under Vermont law, we will not share information we collect about Vermont residents with companies outside of our corporate family, unless the law allows. For example, we may share information with your consent, to service your accounts or under joint marketing agreements with other financial institutions with which we have joint marketing agreements. We will not share information about your creditworthiness within our corporate family except with your consent, but we may share information about our transactions or experiences with you within our corporate family without your consent. California: Under California law, we will not share information we collect about you with companies outside of Bank of America, unless the law allows. For example, we may share information with your consent, to service your accounts, or to provide rewards or benefits you are entitled to. We will limit sharing among our companies to the extent required by California law. For Insurance Customers in AZ, CA, CT, GA, IL, ME, MA, MN, MT, NV, NJ, NC, OH, OR and VA only. The term “Information” in this part means customer information obtained in an insurance transaction. We may give your Information to state insurance officials, law enforcement, group policy holders about claims experience or auditors as the law allows or requires. We may give your Information to insurance support companies that may keep it or give it to others. We may share medical Information so we can learn if you qualify for coverage, process claims or prevent fraud or if you say we can. To see your Information, write Insurance Services, TX2-980-01-43, 4200 Amon Carter Blvd., Fort Worth, TX 76155, Attn: Data Request. You must state your full name, address, the insurance company, policy number (if relevant) and the Information you want. We will tell you what Information we have. You may see and copy the Information (unless privileged) at our office or ask that we mail you a copy for a fee. If you think any Information is wrong, you must write us. We will let you know what actions we take. If you do not agree with our actions, you may send us a statement. For MA Insurance Customers only. You may ask in writing, for the specific reasons for an adverse underwriting decision. An adverse underwriting decision is where we decline your application for insurance, offer to insure you at a higher than standard rate or terminate your coverage. Bank of America U.S. legal entities that utilize the names: Bank of America, Banc of America, U.S. Trust or Merrill Lynch, as well as the following entities: BACAP Alternative Advisors, Inc., General Fidelity Life Insurance Company, Managed Account Advisors LLC, NationsCredit Financial Services Corporation. When you make a purchase, we use your phone’s location services capability to compare where the purchase is made to where your phone is located. The feature works with both cellular and Wi-Fi, meaning that if you’re overseas and prefer to avoid using cell service, Verify Your Visa Card is With You will still work when you’re on Wi-Fi. Sign in to the Bank of America mobile app. Turn on Verify your Visa Card is With You. Make sure your location services is set to always for the Bank of America mobile. This option can usually be located in your phone’s settings. You can review and revise your marketing and information-sharing choices online. The $0 Liability Guarantee covers fraudulent transactions made by others using your Bank of America consumer credit cards and consumer and small business debit and ATM cards. To be covered, report transactions made by others promptly, and don't share personal or account information with anyone. Access to funds next business day in most cases, pending resolution of claim. Consult customer and account agreements for full details.